USAREC Deputy Commanding Officer Col. Donna Martin called it a tremendous honor to be a part of Team USAREC at her welcome ceremony April 9, 2015 at Fort Knox, Kentucky. 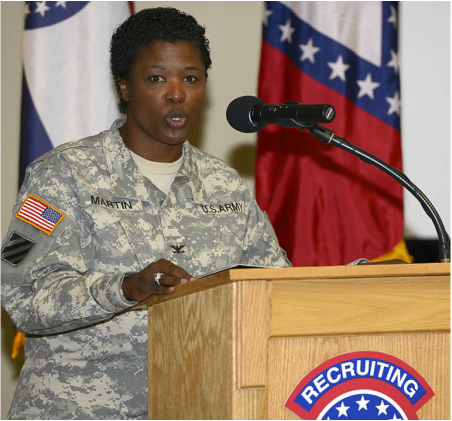 Like many of her predecessors, Col. Donna Martin had no experience in recruiting when she was selected to be the deputy commanding officer for U.S. Army Recruiting Command. She confessed that to Maj. Gen. Allen Batschelet when the USAREC commanding general called her earlier this year welcoming her to the team. “He said, ‘Great, that’s exactly what I want. Somebody to come in and look at this organization from the outside and give me a fresh look, then tell me what you think and ask a lot of questions,’” Martin said. During her official welcome ceremony today at Fort Knox, Kentucky, Martin called it a tremendous honor to be a part of Team USAREC and is excited about the opportunity to serve in the command. Martin said her door will always be open, and she will always be willing to “get her hands dirty” in support of the mission. Martin has been a commander at every level and has served in military police units in the United States as well as Saudi Arabia, Afghanistan and Germany. Batschelet described Martin as a tested leader whose display of great energy and talents led to her being selected for many key assignments, preparing her for significant responsibility. “Donna’s diverse assignments have provided her with an incredible wealth of experience,” Batschelet said. Martin was commissioned a second lieutenant in the Military Police Corps in 1988. Married 20 years, she and her husband, Chris, have a son, Christopher, at the University of Virginia.